Viral Meningitis - tends to appear in summer months and is generally much less severe. Most people recover fully. Initially, vague flu-like symptoms occur with fever and muscle aches. Bacterial Meningitis - tends to be more severe, with a serious risk of complications and death. Any type of bacteria can cause it, but in the UK the most common types are meningococcal and pneumococcal bacteria. The bacteria that cause meningitis vary with a person's age, but meningococcal meningitis is the most common. Meningococcal bacteria are very common and are usually carried harmlessly in people’s noses and throats. It is only when the bacteria get into the wrong place that they cause disease. Meningococcal septicaemia (when the bacteria get into the blood stream) is the more life-threatening form of meningococcal disease. It can present alone or with meningitis, but is more dangerous when it occurs alone and causes most deaths from meningococcal infection. It typically presents with a pin-prick rash that doesn’t fade when pressed. This rash can spread rapidly to form blotches all over the body. 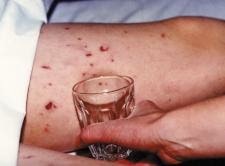 If you're worried that someone has meningitis, or has a rash that doesn't fade when you press a glass on it (the glass test), you must seek medical advise immediately. A rash that doesn't fade under pressure (try pressing a glass against the skin). High fever, Severe headache, Stiff neck, Dislike of bright light, Drowsiness, Confusion and irritability, Vomiting, Muscle pains, stomach cramps and diarrhoea. Cold and pale hands and feet. Complications, especially in bacterial meningitis, include damage to hearing, damage to other nerves in the body, brain abscesses, stroke, and collections of fluid on or in the brain. Although both viral and bacterial meningitis can occur at any age, babies and young children are particularly at risk of meningococcal infection and all types of bacterial meningitis. An additional high risk group is people aged between 15 and 24. Routine vaccination protects against some types of bacterial meningitis, including those caused by one type of meningococcus (MenC), Haemophilus influenzae (Hib vaccine) and invasive pneumococcal disease (PCV vaccine). Vaccination against the mumps virus (for example with the MMR vaccine given routinely to children) protects against viral meningitis caused by mumps. People who have been in close contact with someone who has bacterial meningitis may need to take antibiotics as a preventative measure. The diagnosis is confirmed using blood tests and a test called a lumbar puncture. A fine needle is insertedinto the person's spine to draw out fluid that can then be examined in a laboratory for infectious organisms. Treatment depends on the cause of the meningitis, but intravenous antibiotics will be started immediately and continued if tests confirm the bacterial form. If other causes are diagnosed they will be treated accordingly. Different medicines may be needed to control symptoms such as seizures. Delays in treatment increase the risk of long-term damage. If you suspect meningitis, get urgent medical advice.